I saw advertisements for Cookie Swap! at the Book Expo this past May and knew it was one that I would be highly interested in utilizing during the holiday season. Cookies?! Yes, please. Thanks to Workman Publishing, I had an opportunity to read (and, ahem, bake) my way through it. What makes Cookie Swap! a complete delight when it comes to discussing cookie swaps and learning new cookie recipes? 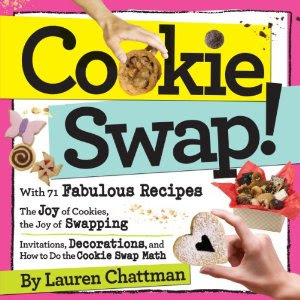 Written by Lauren Chattman, I love that she approaches this book by explaining the joys, the glories and the community that cookie swaps can unite and bring together. This book wasn't written by someone who has never done a cookie swap before and has many good, practical tips for how to pull off a successful cookie swap. By the way, thought it 'tis the season to be baking and giving, Chattman doesn't limit the ideas of cookie swaps to the holiday season only. She offers ideas, tips and suggestions for how to have a cookie swap for a baby or bridal shower, a birthday party, a summer gathering or a "just-for-the-fun-of-it" type of event. Chattman offers numerous planning tips for how to host such a party and I particularly valued her advice in this department. Her advice is common sense, but it is stuff that I wouldn't necessary have thought through on my own (i..e, how to figure out how many cookies to ask people to bring, how to lay them out and plan ahead for take-home containers, etc.) With full colored photographs and full page spreads of photos, it is easy to catch her drift. This book is not only about how to plan a cookie swap party however. Oh no, my friends! In this book you will find a terrific number of cookie recipes, ranging from your traditional peanut butter sort to more imaginative varieties like the gingerbread chocolate chip cookie or the chocolate and peppermint bark cookies. (Note of warning: if you make the chocolate and peppermint bark cookies, you will want to eat more than one. Don't ask me how I know this!) There are recipes for sandwich cookies, bars and even crackers. Another excellent thing to note about this book is that she offers freezer tips as well for each recipe, telling you at what point you can freeze the dough and how long each recipe will save for without going "stale." I really like those notes in particular. Cookie Swap! is a cookie baking treasure chest and I think it's a wealth of fabulous information. Therefore I am tremendously pleased to announce that Workman Publishing offered a giveaway copy to one of my readers here at Reading to Know. Would you care to win? (Pshaw! How could you say no?) Simply leave a comment below. This contest is open to U.S. Residents only and will be open through this coming Sunday, December 5th. THIS CONTEST IS NOW CLOSED. THE WINNER (as selected by random.org) is #4 - Olive's mum. CONGRATULATIONS! Thank you Workman Publishing! And to the rest of you - Merry Christmas and HAPPY BAKING this season! And I blogged about your week of giveaways! I love hosting cookie swaps! So much fun with friends and yummy recipes to learn! Would love more tips and ideas! this sounds like a fantastic book. I love to make cookies with my children and then give lots of them away! Sounds great ... my inlaws are starting what they hope will be a traditional cookie swap each year. Sounds like a great book ... my Bible Study group has a cookie swap for Christmas! We love cookie-baking around here! This one sounds like it's full of fun ideas. Can you believe I've never been to one before? Fun and something I could use! Yum! I've participated in cookie swaps before, and I'd love to see the ideas and recipes in this book! I would love to have this. I would like to try some new recipes this year. I've always wanted to host a cookie swap--this would help! I love baking, especially during the holiday season. Oh, I could've used this to prepare for a cookie swap this coming weekend! I love to bake (and eat, unfortunately) cookies, so sign me up! Blogged about your week of giveaways! I love cookies, so I know I would enjoy this book. I've never participated in a cookie swap, maybe it's time. I bake all the time, but have never participated in a cookie swap. Thanks for this giveaway! Please enter me! I'd love to host a cookie swap this year & this book would really be nice to have. Thanks for hosting! This sounds awesome, I'm baking a bunch of cookies for church and this book would come in handy! Thanks for the chance into this giveaway. Sounds like a great book for holiday baking! This looks like a really useful tool for mass cookie exchanges! Some co-workers have already begun experimenting with new recipes and all have been good so far! Thanks! I'd love to try some of these recipes.